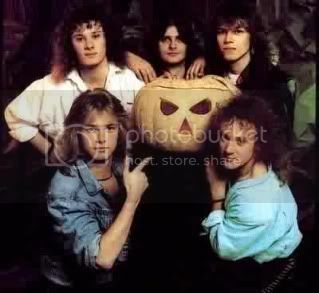 Helloween, if only for the Keeper 1 album. Gamma Rays early stuff is pretty good but Kiske is one of my all time faves. 'cause they're not named "Helloween"
Aargh, that's a hard one. Helloween has produced more "classic" material at the cost of quite a few clunkers. Gamma Ray on the other hand have consistently produced great but not brilliant material over the years. I'm going to give "Helloween" the edge, mostly because of all the great bands that they have inspired (and in many cases provided personnel too). It is a fairly tough choice. Helloween have done a couple that are better than anything Gamma Ray have done, but Chameleon is worse than anything Kai Hansen's current has ever done. I think I reach for Helloween's discs more so I'll go with them. Helloween gets my Metal vote. Kai Hansen on Walls of Jericho is still... Helloween, a classic. Keeper of the Seven Keys Part 1 is unreal greatness for Power Metal. I like Gambling With The Devil a great deal too. You always make it kinda difficult... which is cool. Walls Of Jericho and the 2 Keepers are great album, but in the end I prefer Gamma Ray: I like all the albums (very few bands can keep so high standards through all these years) and Land Of The Free is one of my favorite overall album!!! Man On A Mission is one of the best heavy metal pieces I ever heard!